Sometimes you can feel feel faint with guilt. Before this week, I don’t think I had ever heard of Daniel Hegarty. In 1972, he was shot twice in the head and killed by a member of the British army. 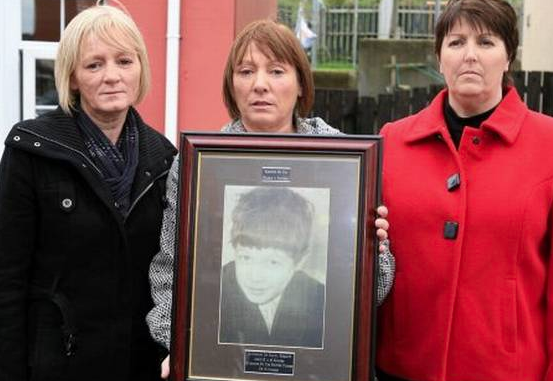 An inquest into the boy’s death in 2011 found that he “posed no risk” at the time of his death. Part of my guilt comes from a fear that I may once, briefly, have been Daniel Hegarty’s teacher. It’s possible. From September-December 1970, I taught classes of First and Second Year boys in St Joseph’s Secondary School in the Creggan area of Derry. Those boys were either 12 or 13 years old in 1970, which means they would have been 14 or 15 in 1972. Daniel Hegarty’s age. I found the boys I taught back then…what’s the word…moving. The day before I left the school at Christmas 1970, there was a knock at the staffroom door – three boys were there, wanting to speak to me. I went to the door, and one of the three held out his hand. “This is your present, sir” he said. In his hand he had one shilling and ten pence. I protested, said I really couldn’t take it, they should keep it and spend it themselves. They looked shocked: “But sir, we collected it for you! The whole class!” I took it, and have never received a more moving present in my life since. Daniel Hegarty may not have been one of those three boys, or any of the boys I taught, but he was very similar to them. He lived his short life in the midst of violence, where state forces showed contempt for the lives of people they claimed they were there to protect. So there was an inquest in 2011 on Daniel Hegarty’s death. That was some forty years after his killing by a British soldier. Why was that? What lies were told about his death at the time it happened? Who decided that the soldier who killed him should evade justice for nearly fifty years? Who decided that 17-year-old Jackie Duddy was to be shot dead in 1972? Or 17-year-old Hugh Gilmour? Or 17-year-old Michael Kelly? And have any of the people responsible for those deaths been brought to justice? We all know that no one will ever face the rigours of the law for their deaths, any more than those who planned the deaths of Pat Finucane and Rosemary Nelson. Or the dozens of other innocent Catholics listed in Anne Cadwallader’s book Lethal Allies. In the place of justice we’ve had decades of lies and obstruction from the state. Those young boys who died had lives stretching in front of them, where they could have enjoyed decades of human experience. Mornings. Evenings. Sunshine. Rain. Celebration. Love. But someone decided they didn’t deserve to experience any of that. They were like you and me. They were like the three boys who pressed one shilling and ten pence into my hand in 1970. And we’re supposed to be grateful for an apology decades later, thankful like the Hegarty family that Daniel’s case will, so many years later, be looked at. The Most Oppressed People Ever? Certainly the most forgiving.